Kamyshlov (Russian: Камышло́в) is town in Sverdlovsk Oblast, Russia, located on the left bank of the Pyshma River (Ob's basin) at its confluence with the Kamyshlovka River. Population: 26,870 (2010 Census); 28,914 (2002 Census); 33,462 (1989 Census). It was founded in 1668 Kamyshevsky ostrog. From 1687 it had been known as Kamyshlovskaya sloboda. Town status was granted to it in 1781. 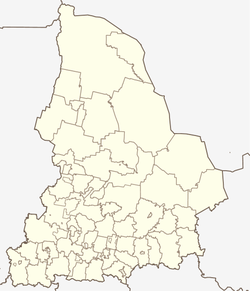 Within the framework of the administrative divisions, Kamyshlov serves as the administrative center of Kamyshlovsky District, even though it is not a part of it. As an administrative division, it is incorporated separately as the Town of Kamyshlov—an administrative unit with the status equal to that of the districts. As a municipal division, the Town of Kamyshlov is incorporated as Kamyshlovsky Urban Okrug. ^ a b c d Государственный комитет Российской Федерации по статистике. Комитет Российской Федерации по стандартизации, метрологии и сертификации. №ОК 019-95 1 января 1997 г. «Общероссийский классификатор объектов административно-территориального деления. Код 65 223», в ред. изменения №278/2015 от 1 января 2016 г.. (State Statistics Committee of the Russian Federation. Committee of the Russian Federation on Standardization, Metrology, and Certification. #OK 019-95 January 1, 1997 Russian Classification of Objects of Administrative Division (OKATO). Code 65 223, as amended by the Amendment #278/2015 of January 1, 2016. ). ^ a b c Государственный комитет Российской Федерации по статистике. Комитет Российской Федерации по стандартизации, метрологии и сертификации. №ОК 019-95 1 января 1997 г. «Общероссийский классификатор объектов административно-территориального деления. Код 65 440», в ред. изменения №278/2015 от 1 января 2016 г.. (State Statistics Committee of the Russian Federation. Committee of the Russian Federation on Standardization, Metrology, and Certification. #OK 019-95 January 1, 1997 Russian Classification of Objects of Administrative Division (OKATO). Code 65 440, as amended by the Amendment #278/2015 of January 1, 2016. ). This page was last edited on 11 June 2018, at 00:17 (UTC).